Morgiana marks the doors of the other houses on her street to confuse the robbers. From Gustav “Tenggren’s Golden Tales from the Arabian Nights” (1957). I was invited to perform in a local Middle Eastern dance showcase. The theme was “Dark Fairytales” and, after considerable pondering, I finally lit upon a suitable fairytale–“Ali Baba and the 40 Thieves”. Specifically, I opted to do a re-enactment of Morgiana’s dagger dance from the story. My first act, after picking out the music, was to see how Morgiana had been interpreted through the years. One of the nice things about the Internet is that occasionally you come across someone who has already done your work for you. In my case, Sherrazah Bint al-Waha had already looked for, found, and scanned different pictures of Morgiana’s climatic dance. All of the photos cited here are taken from her web page. 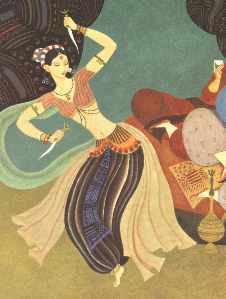 Although the story of “Ali Baba” is set in Persia, as you can see, Morgiana is variously portrayed in Egyptian, Indian, Art Deco, and Orientalist garb. An illustration from an 1890s (?) 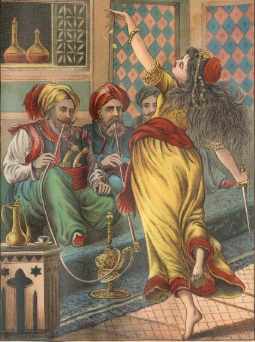 edition of the “Arabian Nights”, artist’s name not given. I would call Morgiana’s garb here Egyptian or Turkish. A completely Art Deco Morgiana. Artist is Lacy Hussar. The picture is from the 1921 Houghton Mifflin edition of the book. 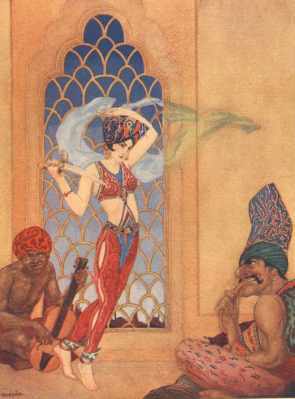 This is the illustration from the version of the “Arabian Nights” I remember as a kid, probably a reprint of the 1946 Grosset Dunlap edition. Artist is Earle Goodenow. Morgiana’s attire is much more Persian here although don’t ask me where the peaked cap and face veil came from. Another picture of Morgiana from Gustav Tenggren’s 1957 “Arabian Nights”. 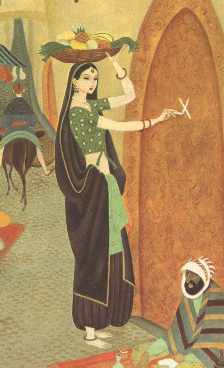 His illustrations show a strong Indian influence. For my solo, I opted to dress in as Persian-like a fashion as I could. I wore a magenta and gold kaftan over a long narrow black dress and belted it with a turquoise and white hip scarf. Over my shoulder, I wore a lavender baldrick attached to a short, realistic looking prop dagger, a sort of mini-scimitar I had just gotten from the local comic shop. The dagger was heavy and I needed both the baldrick and the hip scarf to keep it in place. My hair I simply tied back in a pony tail. I had toyed with the idea of doing a half-turban, but decided against it because it kept slipping off. As it turned out, the theater where we performed was sweltering–80 degrees and 110% humidity–so I’m glad I decided to go turban-less. I also decided to give a Persian cast to my dance as well. From what I’ve seen, Persian dance tends to be halfway between Middle Eastern and Indian dance–small amount of hipwork, large amount of upper body work, with a strong element of mime thrown in. 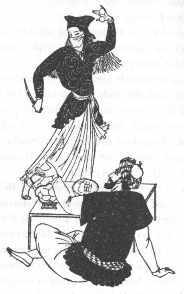 There is a part of Persian dance where the dancer, playing a “tough girl”, pretends to be a man, showing off her biceps. I took that as my jumping off point, figuring that imitating a man as part of her dance would give Morgiana a legitimate reason to be packing a dagger. I opened my solo being very flirtatious and feminine, then segued into the “manly” part of the dance–showing off my muscles, shooting my bow, drawing my dagger, using it as a mirror (pretending to look into a hand mirror is another Persian element), sharpening it, splitting a hair, and, as the music sped up, engaging in mock combat. At the end, I suddenly strike, stabbing the robber captain through, wiping the blood off my sleeve, and then walking out in an unsmiling fashion. I’m not sure how much of the “chirpy entertainment turns deadly” mood I wanted to convene got across to the audience, but they seemed to enjoy it any way.